This edition was published in 1979 by Del Rey/Ballantine Books who commissioned artist Michael Whelan to paint new covers succeeding Gino D’Achille‘s 1973 series. Following in the footsteps of previous illustration greats like Roy G. Krenkel and Frank Frazetta, Whelan brought his considerable skill in research and detail to give us a more fully-realised view of Barsoomian [Martian] life than we had seen before. 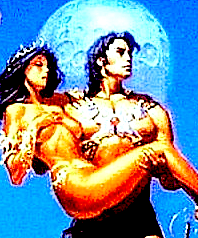 Shown below is a view of John Carter from Earth, [who became John Carter of Mars] carrying Dejah Thoris, the Princess of Mars over the threshold of an ancient Barsoomian palace invaded by nomadic Thark warriors [seven feet tall, four-armed, and green-skinned] and one of the various sentient inhabitants of Mars. The introductory Image for this entry is of Kyle Dunnigan, an American comedian, best known for his role as Craig in Reno 911! and his YouTube channel. I chose his image when I googled my title line ‘Some Other Guy’ in search of an auspicious image to present this entry, because the instant I saw it, it leapt out and struck me so vividly that here, was just what was needed, because he looked like he was in the act of introducing or presenting something in a very positive manner!